Here we list the main types of slot machines available both in land based casinos and also offered in online casino today. There are four basic types of straight slots. The payouts offered by multiplier slots are based upon the number of coins bet on a spin. 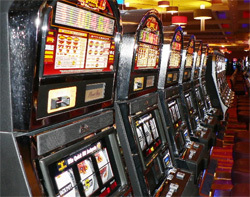 For example, a slot machine might pay 10 coins if you bet 1 coin and 3 cherries appear on a payline. These slots work in the same manner as basic multiplier slots. The only difference is a bonus that boosts your payout for a winning combination if you bet the maximum number of coins. When slot machines first became popular, most of them offered only one payline. Today, many straight slot games offer multiple paylines. Each coin that you bet activates one payline. If a winning combination appears on an activated payline, you win the payout listed on the pay table. This type of slot machine is often misunderstood, even by long-time slot enthusiasts. Buy-a-pay slots offer a number of winning combinations, but will only pay out if you have “bought” a combination. Progressive Slots offer you a chance to win a life changing jackpot while only risking a few dollars (at most). Be sure to play these knowing that the odds of you hitting the big jackpot are about the same as winning the lottery. Always play the max coins so you have a chance to win the jackpot with every spin you take. As you can see there are a multitude of slots available today and it is up to you the player to determine which slot games are right for your budget and skill level.